Hello there cyber world! 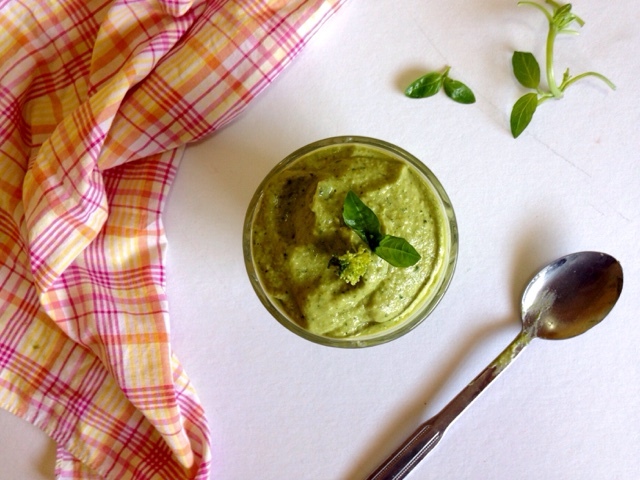 I'd like to welcome you to My Love For Broccoli in creamy pesto form. It's made with cashews (interchangeable with walnuts), garlic, lemon juice, and avocado which gives the sauce its sensational texture! Okay, let's admit it -- we all get our moments of finding emotional comfort in food. I had my last one a couple of days ago, with my body telling me "pasta" repeatedly. While that was happening, our fridge was stacked with beautiful ripe avocados that, quite frankly, at the time, I had almost had enough of from using everyday in my smoothies! 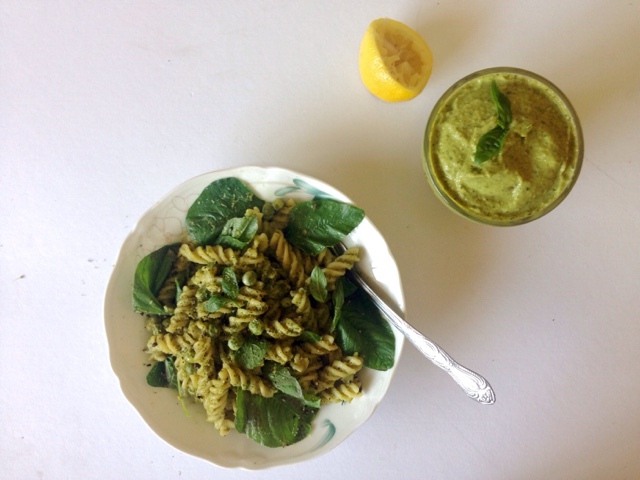 Thankfully though, the avocados in this pesto pasta proved themselves versatile just as they always do. They didn't fail and made me appreciate them even more! I could have gone for a completely unwholesome version of this dish, but considering that I was already in a vulnerable state, I couldn't afford to feel worse by stuffing my body with anything but healthy! So I secured this recipe with a lot of delicious greens (like peas and spinach, which are totally optional) and even went for a gluten-free option for my pasta which is brown rice. This is a fairly easy recipe for anyone to make. Actually, it's quite a special one because it's the very first that I'm sharing with my wonderful online community, Manila Vegans. *insert love here* Spread it on toast, dip chips in it, or use it as a salad dressing which I did with my leftover! The pesto was more than enough for the 4 people that I served (myself included) so make sure to store it in the fridge immediately when not in use -- it keeps for a couple of days! Also, I like my sauce a little lemony so I used the juice of 2 lemons but feel free to adjust the quantity of the ingredients according to your taste. Steam the broccoli florets until very soft that they almost break when forked, around 20-25 minutes. While that’s happening, cook peas with the pasta according to package directions and then set aside. Once the florets have completely softened, crush the nuts and garlic cloves in a food processor/blender by pulsing for about 20 seconds. 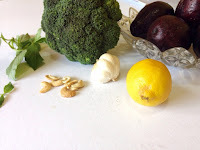 Add the remaining ingredients for the pesto (including broccoli florets) and blend until you reach the creamy consistency of pesto. Adjust taste with salt and pepper and add water if necessary. Transfer the cooked peas and pasta in a large pan over medium-low heat. 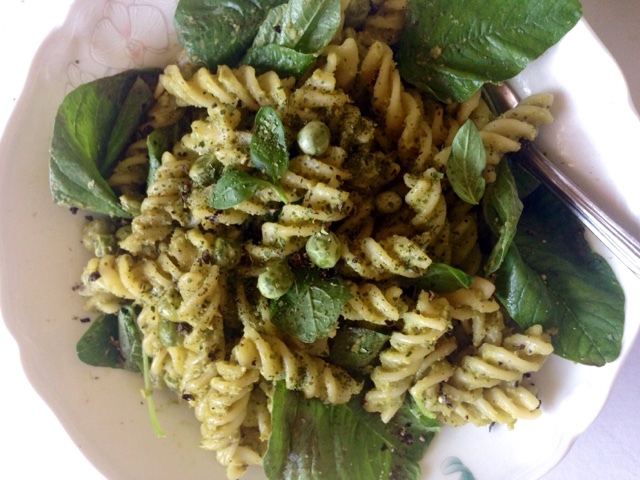 Pour the pesto and stir until the peas and pasta are completely covered in the sauce. Toss the spinach into the pan. Cover the pan and wait 30 seconds to a minute for the leaves to wilt. Give the pasta one last stir before serving. Garnish with black pepper.